Facit 2018 Scandinavia CLASSIC SPECIALIZED (Facit Special Classic 2018) Starting in 2016 Facit was divided. The CLASSIC SPECIALIZED only includes thru 1949. It is fully specialized and in color. Includes stamp, specialized listings, booklets, varieties, FDCs, etc. SPECIAL SECTIONS: Early Sweden, covers/rates, proofs/essays (expanded), 1862 Lion major article; Ringtypes earliest cancels; 1920-36 COILS; BOOKLETS REVISED; Norway early ship and pre-stamp mail; Denmark early cover destinations; GREENLAND PAKKE-PORTOS (expanded) and early postal history; DWI pre-phil covers, postal stationery, shipping co. stamps; ICELAND numeral, C&P, early town, bridge, and military cancels; REVENUES, stationery; skilling covers census; Finland early covers, OVALS major article., etc. EXPANDED ENGLISH. Facit 2018 NORDEN (Simplified before 1950, Specialized 1950 onward) (Facit Norden 2018) Starting 2016 Facit was divided. This NORDEN does include pre-1950 stamps, but only in simplified form (similar to Scott, but including all major Facit numbers). After 1949 the listings are specialized just as they were in the previous editions. 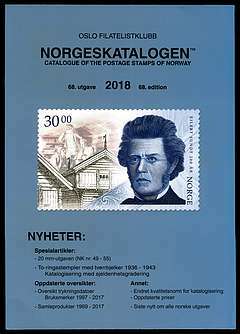 SPECIAL SECTIONS: Sweden MODERN POSTAL FORGERIES LISTING (GREATLY EXPANDED, English text, images); Joint issues that include Sweden; DENMARK MACHINE STAMPS extensive article; Magasin cachets article; many updates in SWEDISH BOOKLETS; Iceland revenues, postal stationery, and official packs (many scarce). Many new images (over 900 in Norway). Otherwise all expected stamp, booklet, machine stamp, FDC, and other listings are present. IN COLOR, with expanded ENGLISH TEXT. Facit 2018 BOTH Classic & Norden -- SPECIAL COMBO PRICE SAVE $10 on the combination of both the Facit Special Classic 2018 and the Facit Norden 2018. $10 savings! AFA Denmark 2018 Catalog The primary annual catalog used in Denmark. Lists all Danish, DWI, Faroe, Slesvig, and Greenland stamps with COLOR illustrations throughout. Includes FDCs, booklets, most major varieties, advertising pairs, coil combination pairs, machine stamps, reprints, Christmas seals, etc. Also prices postally used covers up to 1996. If you collect Denmark (and/or Faroe, DWI, or Greenland), you will enjoy this catalog. Special in this edition: 3-Ring Numeral Cancel town listing. AFA Denmark (and Iceland) Specialized 2016 Catalog Important new edition (issued every 6-8 years!) of this valuable specialized catalog of Denmark, Faroe, Greenland, DWI, Slesvig, AND ICELAND (to 1940). FULL COLOR, in Danish. Specialized stamps, printings, varieties, watermarks, coils, booklets, ad pairs, covers, etc. Now only through 1970 (for later issues see annual catalog). SPECIAL SECTIONS include Returned Letter Stamps, Coils (more than you think), Faroe postal history, early Greenland, Slesvig- Holstein, ICELAND to 1940, COLOR PLATES of all Denmark printings #1-Bicolors, Essays, Proofs, Reprints, etc. ABSOLUTELY MUST-HAVE reference for all intermediate and advance collectors. Greatly improved in many ways. 752 pages. Hardbound. The Danish collectors "bible". Faroe GF10 Specialized Catalog DAKA 2017 The premier Faroe specialized catalog; the 'bible' for Faroe collectors. COLOR illustrations and COMPLETE ENGLISH text. 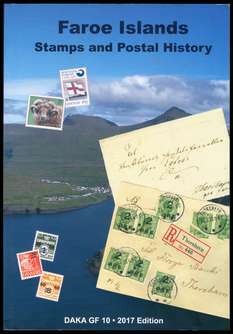 Includes stamps, booklets, FDCs, show cards, packs, maximum cards, FREIGHT STAMPS, REVENUE STAMPS, all the town postmarks (on both older Danish and modern Faroe stamps), extensive (and greatly expanded) postal history including war-time mail, ship postmarks, postal rates (greatly expanded), and MUCH MORE. Now with 316 pages this is significantly revised and expanded since the last (2010) edition. Every collector of Faroe should have this catalog! AFA Iceland (and Denmark) Specialized 2016 Catalog This is the AFA Specialized catalog that is issued only every few years (last in 2008). However, the last edition to include Iceland was 21 years ago in 1995 (and an updated English translation in 1997). As it relates to Iceland this catalog is updated and revised, with mostly replaced images (now in color). To a very high degree, the 1997 translation can still be used with this new 2016 edition. Otherwise this is also the "bible" for Danish collectors and also includes specialized listings for Faroe, DWI, Slesvig, and Greenland. 752 pages. Hardbound. This is a must-have reference. Norgeskatalogen 2018 The catalog for Norwegian specialists; now issued every other year. 2018 is much improved with pricing now for VF and many changes. FULL COLOR, English text in many important sections and English word list. NEW article (text in Norwegian) on identifying 20 mm types. Detailed info on printings, esp 20 mm and Central/Knudsen, varieties, new printings of modern issues, POSTHORN PRINTINGS and TYPES IDENTIFICATION; largest known units; 1997-2017 date blocks, official perfins, POSTMARK FORGERIES, machine stamps, booklets, coils, personalized stamps, souvenir cards, packs, postal rates 1877-2017. SPECIAL: TWO-RING/BRIDGE TYPE CANCELLATIONS 1936-1943 CATALOGING WITH RARITY FACTORS (inc rail & ship), NOT in "Postal". Superb catalog! Norgeskatalogen "POSTAL II" Cancellations / Postal History Catalog / Handbook The second (2014) & enlarged edition of an incredible new catalog / handbook. Pre-stamp postmarks 1845-1855; early single-ring town cancels, 3-ring cancels; 2-ring town cancels 1880-1931; 3-ring cancels after 1883; crown & posthorn cancels (many ships); Post i Butikk (cancels of post offices in stores 2001-2014; bridge cancels (various types) 1889-1936, COVER REGISTER 1855-1909 WITH PRICING by rate, franking, destination! ; Postal rates 1877-2014; ship & railway cancels in various sections; etc. CONTENTS VARIES IN EACH EDITION -- YOU WILL WANT EVERY EDITION! A wonderful resource that is an absolute must-have for every collector or Norway covers and cancellations. Facit Sweden 2017 Catalog (Facit Sverige 2017) Non-specialized, Sweden-only. A great simplified Swedish catalog. This is THE specialized catalog for SWEDEN LOCAL POST STAMPS, from the 1880s issues through the post-1993 issues, up to date. SPECIAL SECTIONS: NEW LISTING of official MAXIMUM CARDS with 550 images, article on freight stamps, and catalog of HOSTEL SEALS. All Swedish stamps, booklets, etc. FURTHER EXPANDED English text (but not yet in the Locals section but it is not really necessary -- I can help if needed). THIS IS THE BEST CATALOG FOR SWEDISH LOCALS (the local post section is specialized). 350 pages, Full color! AFA Scandinavian Christmas Seal Catalog 2012 WITH 2017 SUPPLEMENT (AFA; Julemaerker Norden 2012 and 2017 Tillaeg) ENORMOUS catalog of all major AND ALL THE MINOR/LOCAL issuers of Scandinavian Christmas seals. THE AUTHORS STATE THAT 2012 IS A ONE-TIME EDITION THAT WILL NOT BE REPEATED AT THIS HUGE SIZE (i.e. including all the minor and local issuers). Lists and prices all varieties, imperforates, sheets, booklets, proofs, etc. ; 2012 has 856 pages! The 2017 SUPPLEMENT lists the latest issues PLUS more issues and issuers that were overlooked in the 2012. Handsome, sturdy, softbound catalogs. English introduction; extremely easy to use. THIS IS THE SET OF TWO VOLUMES, BOTH 2012 and 2017 SUPPLEMENT. Both are also available individually. If you collect Christmas seals, this is a must-have reference. NEW LOWER PRICE! AFA Scandinavian Christmas Seal Catalog 2017 SUPPLEMENT (AFA; Tillaeg Til Julemaerker Norden 2017) This is a supplement to the huge 2012 catalog. This is not intended to be used on its own. This supplement only contains the 2011-2016 new Christmas seal issues from all issuers, plus more issuers and issues that were overlooked in the 2012 edition. The set of 2012 and 2017 supplement is available at a special price. This supplement has 152 pages, sturdy softbound. By Mörck (Nordstrøm, 2016) A wonderful new book about the work of STAMP ENGRAVER, artist, and lover of life, Martin Mörck. Engraving stamps since the 1970s, Mörck has built up an impressive resume of Scandinavian stamps and also from many other countries. Though each artist is their own person, I believe I can see Slania's influence in some of Mörck's work. This 250+ page hardbound book is COMPLETELY IN ENGLISH, packed with super-high quality illustrations, and very interesting and wide-ranging text. Whether you appreciate the artistic quality of stamps or wonderful stamp engraving, you will greatly enjoy this book. The Ugly Duckling: Hans Christian Andersen and Danish Stamps (Bundgaard, 2005) A fascinating, well-illustrated, COMPLETELY IN ENGLISH 61-page book dedicated to the HCA stamp (and postal stationery) designs of Denmark. Very readable and very interesting -- just in the first minute I learned of a major stamp variety of which I was unaware! From essays to printing to the booklets, use on covers, the Flying Trunk postal stationery, and the modern stamp issues, this covers it all. Warning: This book may cause a sudden urge to collect HCA stamps. AFA Danish Block of Four Catalog 2017 (AFA Danmark Fireblokke 2017) Lists and prices all Danish mint and used 4-blocks and advertising panes; all 4-blocks, plate blocks, and sheets from Faroe and Greenland; and all Danish L-number plate blocks and sheets. Danish Postal Rates and Postal History 1875-2015 (Bundgaard, 2015; Danske Forsendelser 1875-2015) A combination of a postal rate and postal history book, this is an invaluable reference for any collector of Danish covers. There are good rate books for common rates, for early air rates, and the rates for which stamps were issued. However, this book delves deeper into the rates, including unusual uses. Especially useful are AIR RATES FROM 1950s-1980s which have otherwise been almost impossible to find in the literature. In Danish, but fairly easy to use. Very sturdy softbound. Greatly expanded, now with 272 pages (56 more than last edition). An important and long-needed book. The Maritime Postmarks of the Danish Kingdom (Danielski and Schilling, 2010) A wonderful new, original (not a translation) book published by the Scandinavian Philatelic Foundation. This heavily illustrated, 243-page, hardbound book fills a tremendous hole in Danish philatelic literature. Pictures every ship mail postmark (1854 on), route postmark, paquebot, etc. Describes the routes (back into the 1700s), ships, dates of use, and assigns rarity factors. Includes FAROE and GREENLAND. Plus has 32 page pictorial index of the postmarks organized by appearance / type, making it tremendously easier to find postmark listings. Limited edition which I expect to sell out. Postal Rates in Iceland 1870-2009, Second (2017) Edition (Flack, 2017) The primary reference for Icelandic postal rates. Significantly UPDATED. Entirely in English and with 229 pages and color illustrations. A monumental work including the local, domestic, Nordic, European, and world rates; parcel rates, special services, etc. Due to the massiveness of the information, the worldwide parcel rates only extend to WWII (thus keep your old edition for the partial later worldwide parcel rate information it includes). The rate tables are easy to understand and use; the air tables include both the supplemental air rate information and the total of the air and the surface components. This is a must-have book! Norway Parcel Post to 1945 (Ellis and Totten, 2011) A wonderful, long-needed work on all aspects of Norwegian parcel post, from the beginnings up to 1945. Includes domestic and foreign uses, periodicals and newspapers, cash-on-delivery, etc., with cataloging of the recorded postmarks, postal forms / parcel cards, labels, etc., as well as the domestic and to-Nordic parcel post rates. Well written, and well illustrated in color. 73 pages, metal-coil binding. 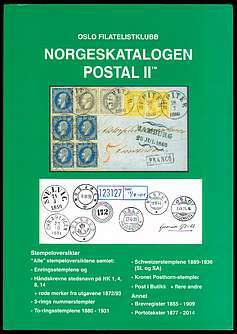 A must-have book for any collector of Norwegian postal history. Spitzbergen Cruise Mail 1890-1914 (Inc. Local Post Stamps & Postmarks) 3rd Ed (Adams, Totten, and Williams, THIRD EDITION 2011; Spitzbergen Cruise Mail 1890-1914) Fascinating and extremely useful 86-page, entirely English language, color-illustrated book describing the postal history of the early Spitzbergen mails which mostly emanated from tourist cruise ship visits. Includes extensive details on the ships, routes, and cruising activity, but especially cataloging and illustrating the local post stamps and labels, and the postmarks and ships cachets, etc. Wonderfully produced. THIS THIRD EDITION HAS 28 MORE PAGES than the 2nd Edition; even if you have a previous edition, I highly recommend this new, expanded edition. 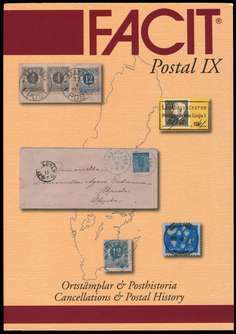 Facit Swedish Postal History / Cancellation Catalog IX (2015) (Facit, 2015; Facit Postal IX Ortstamplar & Posthistoria) Grealy improved primary priced catalog & handbook for postmarks, inc. town, railway, ship, rural, military, UN, foreign, pre-stamp, etc. Also includes extensive postal rate charts (extremely useful, now updated to 2015! ), major pre-stamp postal history section and expanded postal labels list. PERFINS with pricing for stamps and covers! GREATLY EXPANDED AND IMPROVED, now 556 pages. Added modern/current cancels; expanded rural cancels; revised and expanded ship cancels, and now with Malmo Post. Many updates and additions everywhere! Greatly improved REVERSE ALPHABETICAL TOWN NAME INDEX. This is THE must-have reference for cancel and postal history collectors. 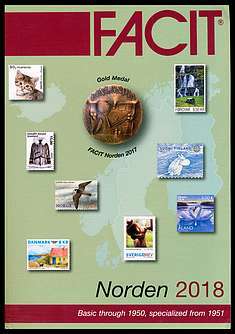 Sweden Local Post Catalog (Facit Sweden 2017 Catalog) (Facit Sverige 2017) Non-specialized, Sweden-only. A great simplified Swedish catalog. 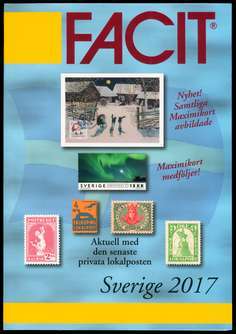 This is THE specialized catalog for SWEDEN LOCAL POST STAMPS, from the 1880s issues through the post-1993 issues, up to date. 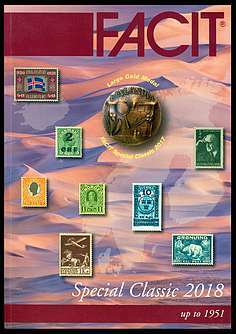 SPECIAL SECTIONS: NEW LISING of official MAXIMUM CARDS with 550 images, short article on freight stamps, and catalog of HOSTEL SEALS. All Swedish stamps, booklets, etc. FURTHER EXPANDED English text (but not yet in the Locals section but it is not really necessary -- I can help if needed). THIS IS THE BEST CATALOG FOR SWEDISH LOCALS. (The local postal section is specialized). 350 pages, full color!